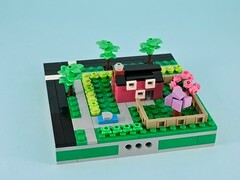 I’ve posted a number of articles now on building little trees (happy, studly, and slopey) and they have all been built around a core of travis bricks. Though I haven’t even begun to exhaust the possible permutations and hybrid techniques available, I decided to try something completely different. This time I’ll be building trees using elements pierced by different lengths of bar. 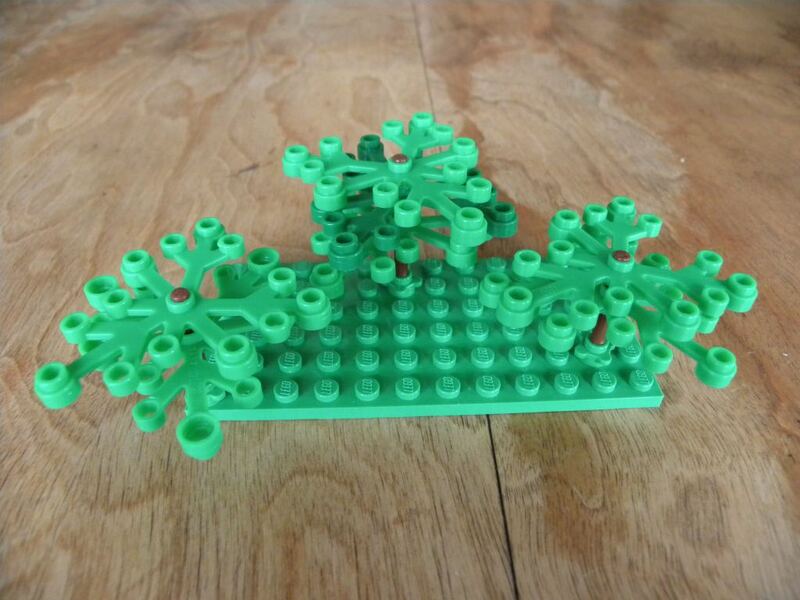 The classic Lego foliage element is an interesting piece. 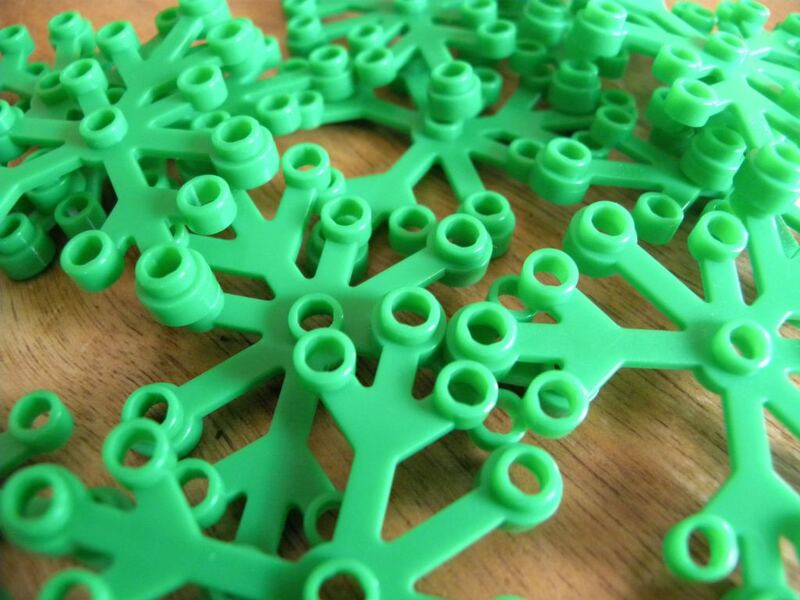 Made from a softer, more malleable plastic, all of its many studs are open and have good clutch. This means that they can be threaded onto a humble bar to make simple, fluffy trees. For these I have used the longer bar (6L with stop ring) and threaded four foliage elements onto each one. By rotating the elements and mixing colors, I get nicely organic trees. The main problem with using bars is that the trees can’t be attached to a stud, but they will socket securely into the open stud of a jumper (or any other element with an open stud). I can build fall trees too. 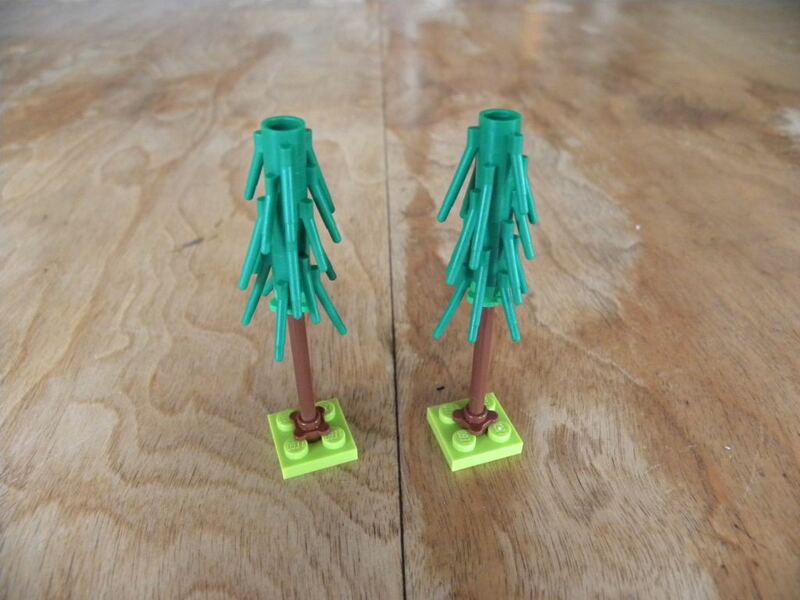 The tree on the left uses the smaller 3×5 foliage element. This foliage element doesn’t have a hole in the center, so the I had to mount them radiating out. The resulting foliage isn’t quite as satisfying as 6×5 elements, but it provides a great color. There will be new shades of purple available next year that will be great for flowering trees. 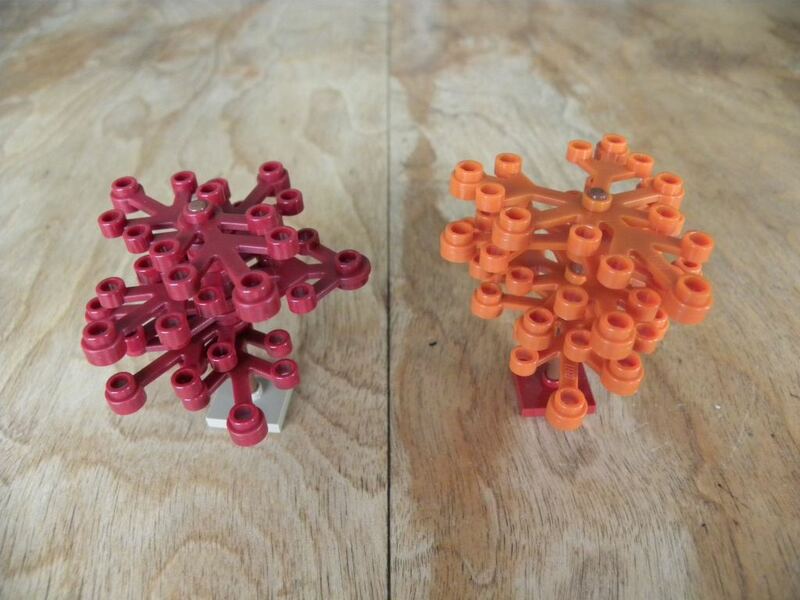 I also tried using some clones (non-Lego copies of this element), but they don’t seem to have any clutch and the bar slides through freely, thus they don’t work for this technique. I put together a few more trees using shorter bars and built this little stand of trees. Instead of mounting them to jumpers, I used the open studs of 1×1 flower plates. The problem here is that the ground is the same color as the foliage. Without contrast, the softer outline of these trees just disappears. They would look much better on a dark tan plate with scattering of green elements to represent undergrowth. This last batch of trees was built denser, with the foliage elements packed tightly against each other so that they clump and flex. I added pink flower plates to the tree on the right and it provides a lovely burst of color. I can’t wait to use these lovely little trees in a scene. Of course, the foliage element isn’t the only way to go. 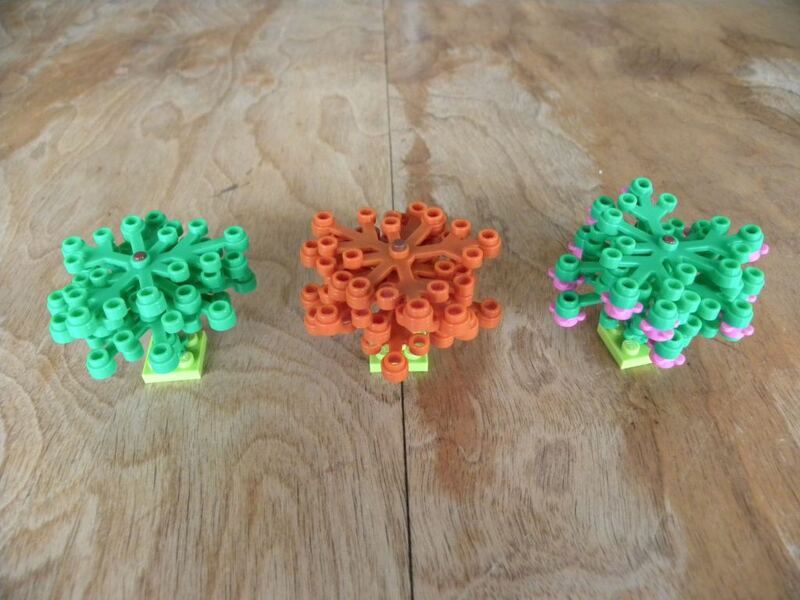 These trees are stacks of 2×2 round plates with a bar passing through their open centers. I have inverted and rotated the plates to break up the cylindrical shape. 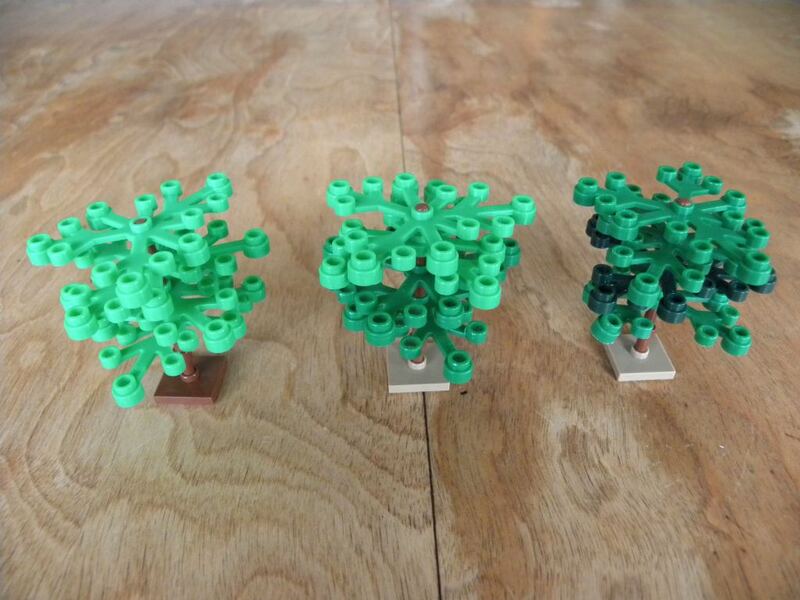 These trees are also a lot of fun and could be made with any number of colors to provide variation. This tree breaks up the cylinder by attaching plates at offsets. These off-center plates can only connect by a single plate (otherwise the bar wouldn’t be able to pass through the center), but by sandwiching them tightly, the tree winds up being loose but stable. I am not entirely sold on this particular tree, but I think the technique merits some further exploration. My last posted tree is a tall, thin conifer made from an inverted stack of flower stems. Again, I have used flower plates to connect each end of the bar to a stud (on between studs). The bright green in nearly invisible under the downward sloping flower stems. 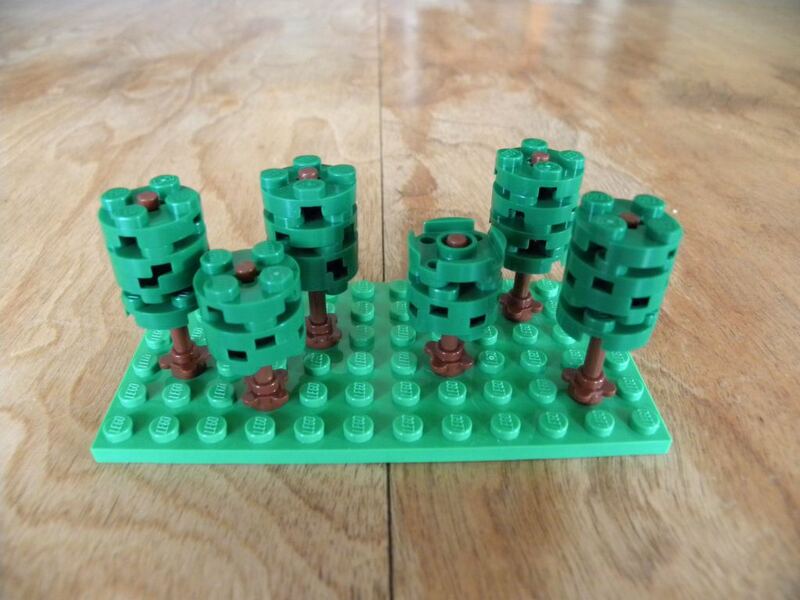 These trees show yet another great way to reuse minifigure scale elements for microscale models. 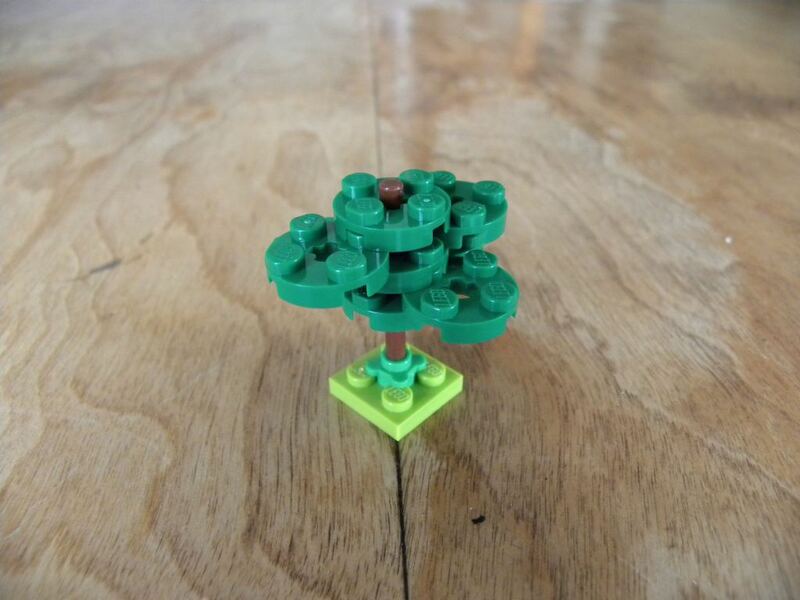 There are probably a million more trees that could be built with these techniques. Feel free to sound off in comments if you’ve seen some good ones. I’ll push the bars into a brown cone at the base. 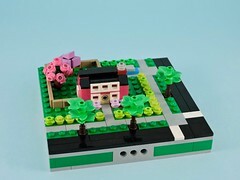 This helps give a little bit of trunkishness and also a nice stable base that can connect to studs and between studs. I’ve seen the cone technique too, but I stumbled into using the flower plates and wanted see what I could do with it. The nice thing about using them instead of cones is that if a disconnection occurs, you still have the flower plate to show where the tree should go.